Edward Lowry, the Dean of Shotshell Ballisticians, published his work in private journals, two hardbound mainstream books, and introduced the ground-breaking Shotshell Ballistics for Windows in 1996 with partner Keith Garner. Mr. Lowry spent many years with Olin-Winchester, and was heavily involved during the critical mandatory use of steel shot years, in conjunction with SAAMI, Winchester, and U.S. Fish and Wildlife. For educational purposes only, here is a glimpse at some of his findings, most of which appeared in 1989 in the American Rifleman. was a new and greatly improved set of shotshell ballistic tables. 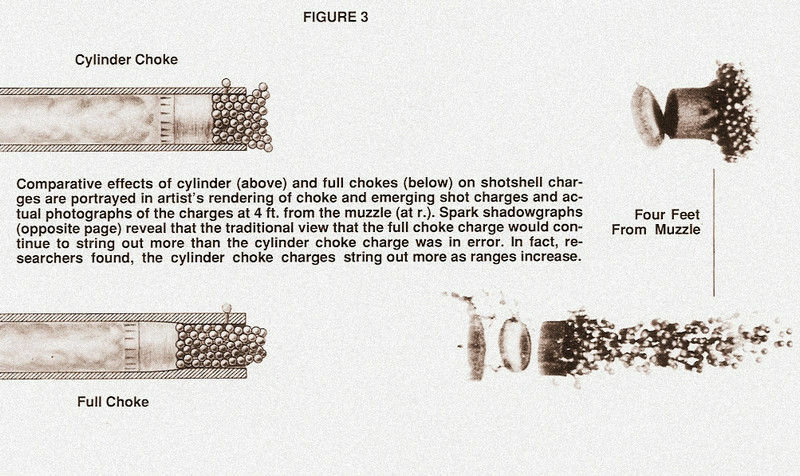 The second was a much clearer understanding of how a shotgun choke actually works and how it acts to determine downrange shotshell performance. Both of these unexpected benefits resulted from an extensive exterior ballistic program that, for the first time, actually measured the in-flight behavior of shot clouds. This ballistic program was prompted by the need to unravel a ballistic puzzle that came about in the following way. The shotshell industry, in response to the concern over the potential for lead poisoning of waterfowl, had launched an exhaustive search for a non-toxic lead shot substitute in the 1960s. After a thorough study of many candidate materials, it concluded that steel shot was the only one that deserved any serious consideration. But an adequate assessment of steel shot's feasibility in waterfowl hunting loads required that it be loaded and actually tried against real targets. So the shotshell industry, in a participative effort with the U.S. Fish and Wildlife Service, organized a test to compare the relative lethal behavior of standard lead and experimental steel shot loads. This was the well-known 1968 mortality test that the U.S. Fish and Wildlife Service performed at its Patuxent Research Center against some 2,000 mallards. The ballistic puzzle appears in those numbers which told us that a load with only 1 oz. of No. 4 steel shot killed almost as many targets as as a load with 1-1/4 oz. of No. 4 lead shot. To explain such results we needed good estimates of striking energies for both lead and steel pellets. But the only available shotshell tables at that time were those used by the member companies of SAAMI (Sporting Arms and Ammunition Manufacturers Institute). Their accuracy, unfortunately, was very much in doubt. For one thing, no one seemed to know where these old tables came from. They gave energy , values that did not correspond to actual measurements, and they failed to show known, but unexplained, ballistic differences caused by different shotgun choke constrictions. The situation finally led to a decision, supported by SAAMI, to first measure the downrange ballistic behavior of lead and steel shotshell loads and then produce the very much needed new set of shotshell tables. Measurement of the exterior ballistic behavior of shotshell loads, however, presents a particular problem. Since a shot charge travels as a cloud of pellets, not as a single projectile, conventional disjunctors are not adequate. Consequently, in order to accomplish the program objectives, Winchester research engineers were required to develop a technique that not only measures the time of flight between the muzzle and any selected downrange of point but does so for every pellet in a shot cloud. Fig. 1 outlines the experimental set-up. The gun fires at a lead screen located at a downrange point. A bank of lights illuminates one side of the screen while a very high speed movie camera focuses on the dark side. As individual pellets in the cloud penetrate the screen, the camera records points of light caused by the pellet holes. Millisecond timing marks on the film then make it possible to obtain the flight time of every pellet in the cloud. The measurement program used this procedure with several rounds of each ammunition at various downrange points. Among those things we learned from this program, two were of specific relevance to the unexpected performance of steel shot. The first was the importance of pellet shape. A lead pellet, because it weighs much more than a steel pellet of the same size, has a natural ballistic advantage. But when it is deformed in the barrel by the crushing forces of peak pressure set-back, it loses part of that advantage to the undeformable steel pellet. Set-back deformation produced the large, saucer-shaped depressions in the lead pellets. Such shape distortions cause losses in velocity and a complete set of exterior ballistic tables decrease the energy that pellets deliver to a target. Some additional distortion also took place during target impact. This total distortion, suffered by the unbuffered lead pellets, depleted their killing effectiveness and helped explain why steel compared so favorably with lead at Patuxent. A second thing we learned from our ballistics program was the revelation that then-current methods of velocity measurement gave false values. With shotshells the conventional practice is to measure a starting velocity at 3 ft. from the muzzle. We found that a substantial correction must be made to convert a 3 ft. velocity reading to the actual velocity at 3 ft. This correction, moreover, is much larger with steel shot. We also learned that the magnitude of such a correction depends on the choke constriction of the gun that fires the round. An illustrative example compared the performance of two shotshells, one with No. 4 lead and one with No. 4 steel. Each lead had the same specification for a measured velocity of 1275 fps when fired from a full-choked barrel. The No. 4 steel load's measured 3 ft. velocity is 99 fps lower than its actual value. It also shows that to have an actual 3 ft. velocity of 1374 fps, it would need a 1415 fps velocity at the muzzle. More detailed comparisons of several loads appear in Table 3. Observant readers may note differences between its values and those in other currently published tables. Table 3's values were based on a carefully executed and well-monitored set of ballistic measurements. But it appears that some of the other tables in print display an unwarranted generosity in the high values they assign to downrange velocities and energies. What actually happens inside the barrel and how a choke works was established long ago. 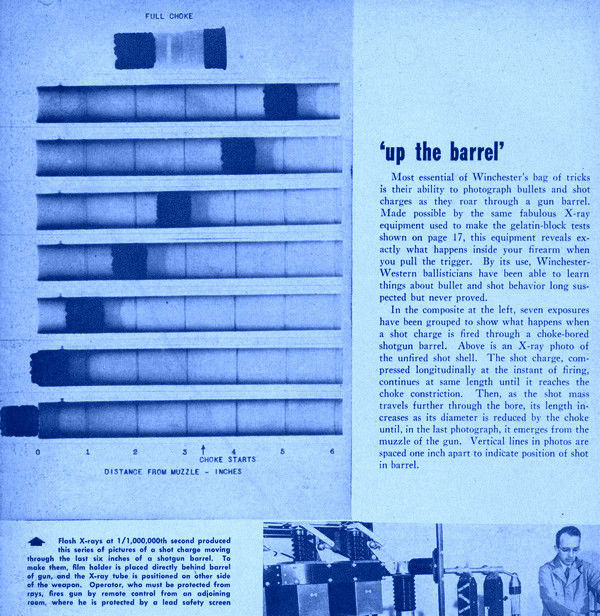 In April, 1949, "Up The Barrel" (above) was published, publicly documenting what Winchester-Western ballisticians were able to learn about shot behavior inside the bore. For the shooter, the basic purpose of the choke is to control pellet dispersion. Fig. 3 depicts the way a choke does this. It shows, for example, when a shot charge is fired from an unchoked or cylinder bore barrel, the force of air resistance immediately begins to flatten the compact mass and disperse its pellets. A full choke, on the other hand, acts to squirt the shot in a way that separates the pellets from mutual contact and thereby prevents the dispersive pushing action. Thus, all the pellets tend to fly along a straight line parallel to the bore. For the shot column fired from the full choke to string out this much while it traverses 4 ft. means that its front pellets must be moving much faster than its rear pellets at this point. Such velocity differences, also determined from many other old photographs like those in Fig. 3, were believed to be the primary cause of shot stringing. This in turn helped feed the popular belief that full-choked barrels give longer shot strings than more open bores. One way to clear up the a troubling question like this is to take a photographic look. 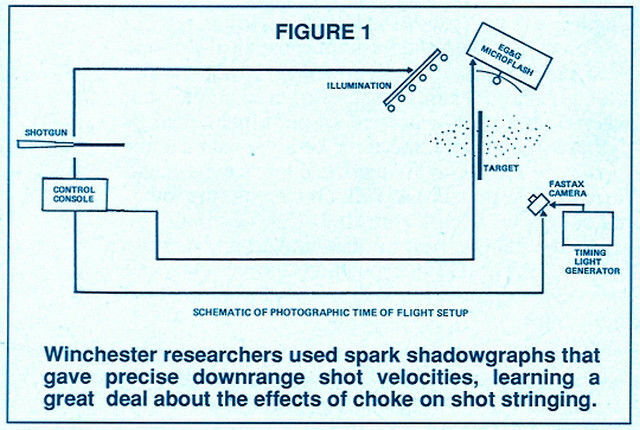 So, a series of spark shadowgraphs were taken, at four ranges, of a standard trap load fired from a full choke and from a cylinder bore gun. These shadowgraphs appear as Fig. 4 (above). The pictures reveal that at 6 ft. from the muzzle the full-choke string is the much longer one. However, at 14 ft., the differences in string length have diminished, and at 18 ft. the cylinder-bore string is already at least as long as the full-choke string. With the evidence of such pictures as these, we gain an understanding of what actually transpires during the transitional period between the instant muzzle exit and the time when all the pellets are finally in free flight. An explanation of what takes place goes roughly as follows. The front pellets of of a shot cloud fired from a full choke quickly separate and, once in free flight, leave turbulent wakes. Resistance to pellet motion is less in this turbulent air than in normal air, so these pellets begin to catch up. In this way the front pellets act as a sort of windbreak. Pellets in a cloud fired from a cylinder bore, on the other hand, disperse very rapidly and fly in a protected atmosphere for a much shorter time. Accordingly they more quickly achieve free flight and become subjected to the full force of air resistance. It is because of this transition behavior that measured 3 ft. velocities give erroneous values and need to be corrected. Only the front pellets are in free flight immediately after muzzle exit, and it is their initial velocity that determines the downrange performance of the whole shot charge. But since the shotshell industry's standard coil disjunctor responds to the the shot column's center of mass, it just measures the average velocity of all the pellets. 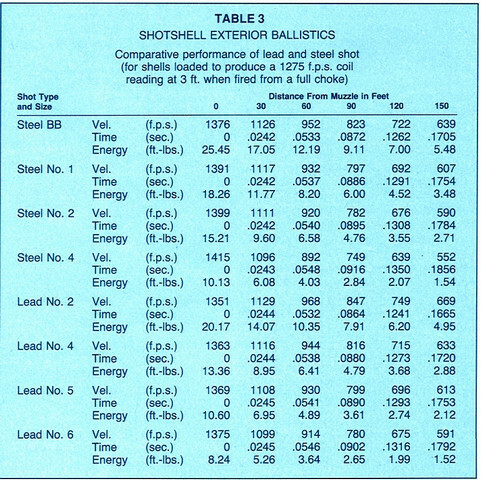 In summary, the shotshell exterior ballistics measurement program fulfilled its objective and produced a set of tables much more accurate than those previously available. In the process, moreover, the program gave us a better understanding of the way that choke constrictions influence shotshell ballistics. But the original goal of this program was more than just a general desire for accurate ballistics tables. Its very specific purpose was to get an explanation for the comparative performance of lead and steel shot in the Patuxent tests. The biggest step toward an explanation was the program's solid confirmation that both lead and steel pellets obey the same physical laws of motion. This means that the ballistics behavior of any shotshell pellet, whether it be lead or steel, depends only on its shape, its weight, its size, its velocity, and the condition of the atmosphere through which it moves. So lead, by virtue of its higher density, is greatly superior to steel as a material for shot. 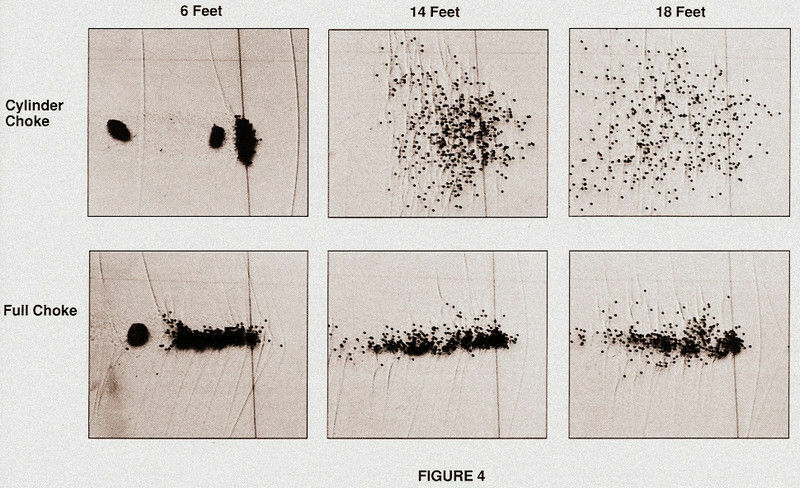 But, as already mentioned, the lead pellets in the loads at Patuxent lost much of their natural advantage when set-back forces disrupted their spherical shape. Our shotshell measurement program confirmed the enormous importance of pellet shape on ballistic performance. Thus, what we really learned from Patuxent was not how well steel pellets do, but, instead, how badly lead pellets perform when they are unprotected from the crushing force of set-back. How can all of this information be of any practical use? The answer is that it can provide some helpful caution. The numbers in the new tables will tell him that steel simply does not perform well at long ranges. There are some very able shotshell development engineers in the industry. But steel's density limitation is such that that no one of them will ever be able to to develop an effective long range steel waterfowl load.